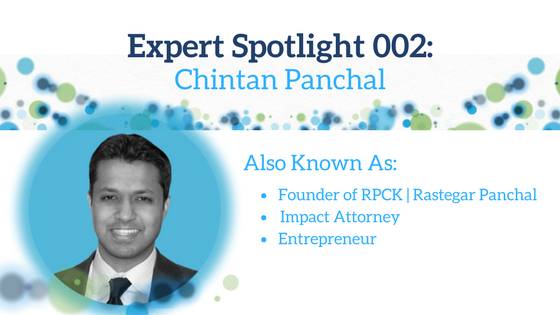 This week’s Expert Spotlight is focused on a very good friend of ours, Chintan Panchal. We like to call Chintan “the Impact Attorney”. His firm, RPCK|Rastegar Panchal is a global private equity focused law firm with offices in New York and Vienna, providing legal services to growth business enterprises at all stages of development. Their clients range from global enterprises to entrepreneurial start-ups, as well as the private investment funds, investment advisors, foundations, and other institutions that finance them. Many of Chintan’s clients have a focus in Impact Investing. As Chintan says, I work with incredible people doing amazing things, around the world. Chintan was selected as a 2014 and 2015 New York Metro Rising Star by Super Lawyers. Well regarded in the sustainable community, Chintan can often be found speaking at Impact and ESG events. If you’ve read our blog post, “A Story of Two Impact ‘Aha! Moments’” you’ll recall that a conversation that Chintan had with our Founder Steve Distante was the spark that inspired the ultimate creation of Impact U. To learn more about Chintan Pancahl, and to check out more of his content, find his expert page here.